The British Gazette » Brexit: Tempus subsisto? Notice to all readers: Your Editor is NOT homesick. Notwithstanding the statement above, despite finding myself well settled and happy in my new residence and with my new life, it is not and will not likely be my home. “Home” is in Leeds in the West Riding of Yorkshire. I now know how my late father felt about the south west of England. “Dad” moved to Leeds in 1950 and died there in 2003. Fifty three years. He had made a life there and was well loved and well respected. He had friends. Yet for him, Leeds was not home. “Home” was essentially the south west of England. Draw an imaginary line from where the Avon flows into the Severn estuary across England to Beachy Head and to the south and west of that line was the area “Dad” regarded as where “home” could be. Ideally, South East Cornwall or West Devon. 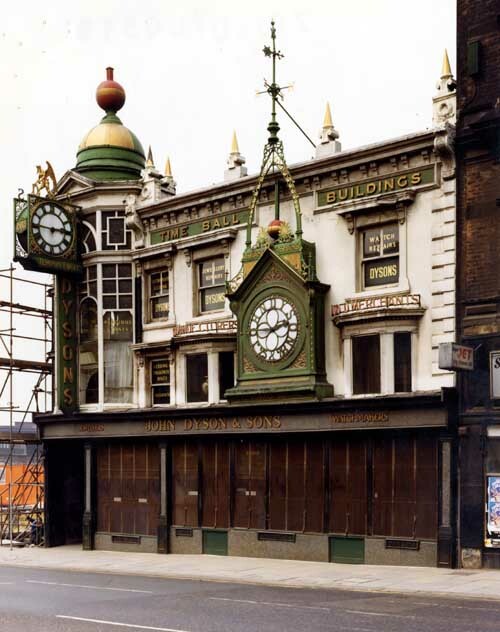 Thus when I read Dr North’s post today (http://eureferendum.com/blogview.aspx?blogno=86635) an image of John Dysons and the famous Tempus Fugit clock came to mind. The image above was taken in November 1979 and shows the shop closed. The building is grade II listed. It is the Time Ball Buildings at 24-26 Lower Briggate. I remember the shop when it was a jewellers. It is now an Asian restaurant. With a good reputation I believe. The Latin phrase Tempus fugit of course is found on many clocks. Generally assumed to mean “time flies”, the source lies in volume three of Virgil’s Georgics; as “fugit inreparabile tempus” (it escapes, irretrievable time). The English translation of “Tempus subsisto” is time to stop. In yesterday’s article (http://www.british-gazette.co.uk/2017/10/13/brexit-day-2019-a-stay-of-execution/), we speculated upon the prospects and possibility of the Article 50 clock being stopped – following Taoiseach Varadkar, Simon Coveney, TD the Minister for Foreign Affairs and Trade and Helen McEntee, TD the Minister of State for European Affairs. These three good people will be fully and completely aware of what a so-called “crash Brexit” so eagerly desired by such as Mr Farage would do the the Irish economy. Mr Farage and his ilk are very fond of quoting, ad nauseam, that the EU does so much trade with the UK that they will do a good deal if pressed and that the loss of such trade would hurt them as much or even more than it would hurt the UK. Mr Farage is not wrong when he says that German car makers would not like to see their British markets disappear. But let us focus on Ireland. Here is a FACT: The UK is the Republic of Ireland’s most important trading partner. By far. Here is another FACT: If the UK economy is wrecked following a train crash Brexit so too will the Irish Republic’s – albeit to a lesser extent. Here is another FACT: Mr Varadkar, Mr Coveney and Ms McEntee (Mrs Paul Hickey) will as diligent and responsible ministers will be doing their utmost to protect the interests of the Republic of Ireland. Which they should! That is why the Irish people elected them to office after all! This organ is not party to the discussions taking place in the council chambers of the European Union but we can be fairly certain that the Irish trio will be bending every European ear they can come across into which they will plead their cause. There is another authority we need to take into account. That of Mr Séamus Woulfe, SC the Attorney General of Ireland. Ireland’s chief law officer will be as concerned as his colleagues at the seeming mad dash to the rocks of economic destruction urged by such as Jacob Rees-Mogg – who were there to be an “Upper Class Twit of the Year” competition, would surely be favourite to win! For whilst Mr Rees-Mogg may seek economic destruction for his country, Mr Woulfe does not seek this for his! One can be sure that Mr Woulfe will be applying his legal mind to the text of Article 50! Tutored in the law as one such as he is there will be a word flashing like a beacon in his brain. That word is “remedy”. Basically in legal terms it is thus: If there is a dispute, there must be a remedy offered. In relation to Brexit, what this means is that the EU cannot terminate or suspend the talks without offering the UK a remedy. Were they to do so the UK would be able to take action against the EU. There exists the Vienna Convention on the Law of Treaties between States and International Organizations which is an extension of the Vienna Convention on the Law of Treaties which deals with treaties between States. It is yet to enter into force but were the EU to suspend the talks and not offer the UK the ability to “stop the clock” vis-à-vis Article 50’s two year period the UK would have a justifiable complaint which could be taken to the United Nations. Now, were President tuck to make such a statement and leave it at that, this would leave the UK in an invidious and dangerous situation. Were he to make the statement on 15th December 2017 there would be 470 days until Brexit Day! This would in effect be holding the UK to ransom. Therefore, international law would insist upon a remedy to be made available to the UK. The obvious remedy would be to offer the UK the ability to “stop the clock” on Brexit. This would mean that along with suspending the talks until a UK government puts forward an acceptable set of proposals, the EU27 would have to agree to the European Council “stopping the clock”. Were they to do so, the clock would not be stopped until the UK [the Member State concerned] also agrees. Since this is a decision taken by the European Council, it does not require ratification by the legislatures of the member states or the consent of the European Parliament – or God forbid, a referendum in Wallonia! Thus, expect on Friday 15th December 2017, Madam Mayhem to presented with the option to stop the clock. At this point, some Tories may be of the opinion that all it needs is for Madame to notify President Tusk of her decision. The British Gazette however is firmly of the opinion that it is NOT Madame’s to make! It is Parliament’s! This is because the 1688 Declaration of Rights and 1689 Bill of Rights require that the Sovereign (in whose name Madame acts) to obtain the consent of Parliament to amend, enact, repeal or suspend laws. Since Article 50 running it’s course and the EU treaties ceasing to have effect after 11:00PM on Friday 29th March 2019 any change to this requires Parliament’s consent via an act of Parliament. At this point many may suggest that not only Parliament’s consent be sought but the voters as well in the form of a second referendum. This is because “stopping the clock” either postpones Brexit indefinitely of for a considerable period. Whilst there is a democratic argument for a second referendum, it is more likely that Madame will be persuaded by the political argument which will be the same as the argument presented to Harold Wilson – to keep her divided party together! IF President Tusk makes the announcement we suggest he may make in mid December, we could expect a referendum on or around Thursday 15th March 2018 – the Ides of March!